Gedetailleerde kaart van dit prachtige gebied; deze kaart is geplastificeerd, scheur- en watervast. The Lake Louise and Yoho National Park areas offer some of the most scenic and accessible hiking trails in the entire Canadian Rockies. This map covers all six of the most popular trail networks in the area - the Chateau Lake Louise, Moraine Lake, Skoki Valley, Emerald Lake, Yoho Valley and Lake O'Hara areas. Best-known trails on this map include the two classic "tea house hikes" to Lake Agnes and Plain of the Six Glaciers teahouses; the hike to wildflower heaven at the Saddleback and beyond to panoramic views at the summit of Fairview Mountain; the overnight trip into prime alpine country in Skoki Valley, the renowned Larch Valley Trail at Moraine Lake, resplendent in September; the Iceline Trail in Yoho Valley, offering close-up views of Emerald Glacier; and the spectacular high-elevation trails at Lake O'Hara leading to Lake Oesa and Lake MacArthur. 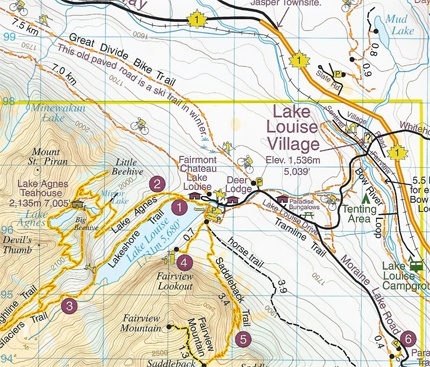 On the back of the Lake Louise & Yoho map are 1:25 000-scale inset maps of the Chateau Lake Louise and Lake O'Hara areas, offering more detail on the trails in these popular hiking destinations. There is also a comprehensive written section on Lake O'Hara that explains what facilities are available, how to book the bus to Lake O'Hara, and describes seven of the best day hikes at Lake O'Hara. Also on the back of the map are photos and trail descriptions of 11 other recommended day hikes covered on the front of the map, ranging from easy lakeshore walks to more demanding hikes into alpine country. Four overnight or multi-day trips are also featured, along with contact information for two backcountry lodges - Skoki Lodge and Twin Falls Chalet.